It’s September, which means it’s summertime in the Bay Area! Cook a light meal, finish dinner early, and enjoy those warm nights while they last. This Light & Creamy Pasta is the perfect dish, and it takes less than 30 minutes to whip up. The lemon zest makes it taste light. The parsley makes it taste fresh. The heavy cream makes it saucy but not heavy like cheese. Yum! 1. Fill a large pot of water. Add salt (salt it until it’s like the ocean), and turn the stove on to high. While the water is coming to a boil, let’s work on the other ingredients. 2. Salt and pepper the chicken breast meats. Add 2 tablespoons of oil to your pan and let it heat up. Then add the chicken. Cook for 3 minutes on each side, until the chicken is cooked thoroughly (make sure the inside is NOT pink and white throughout). 3. Once the chicken is cooked, let it cool down and shred up the pieces. I like to use my fingers to shred the meat (hence the cool down). 4. At this point, the water should have come to a boil. Add the pasta and let it cook while we finish the rest of the meal. 5. 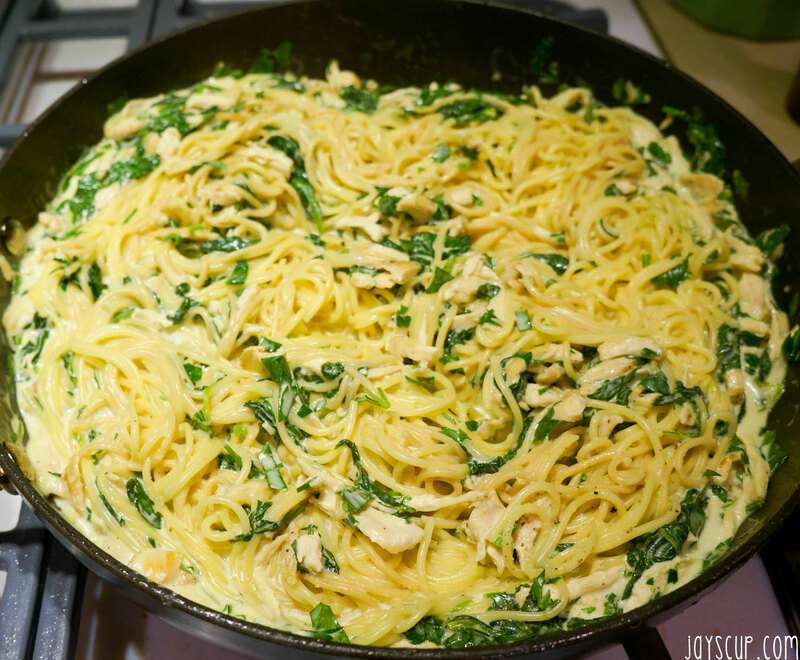 Using the same pan that you cooked the chicken with, add the spinach. Once the spinach has condensed, add the lemon zest. 6. 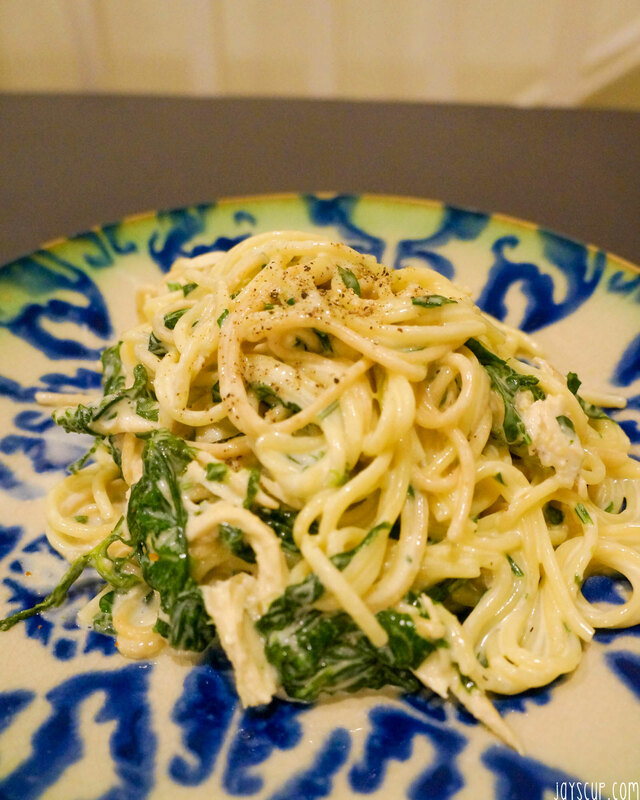 Pour the heavy cream onto the spinach and lemon zest, and let it reduce so that the sauce becomes thicker. 7. 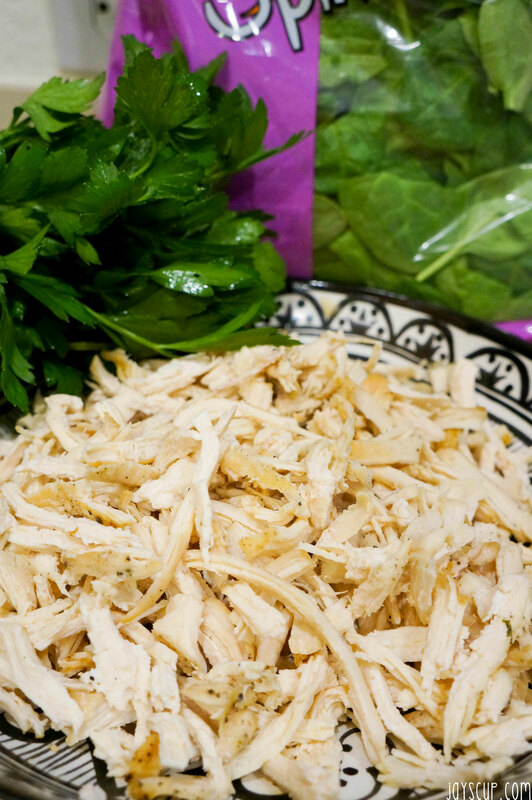 Add the chicken meat to the creamy mixture and the chopped parsley. 8. Drain the pasta, and toss it into the creamy sauce. 9. Plate the light and creamy pasta onto serving plates, and NOMs! I like to snack on the shredded chicken. Kitty likes snacking on the meat too! This entry was posted in Food & Recipes and tagged chicken, cream, creamy, dinner, food, lemon, light, meal, pasta, spinach, summer. Bookmark the permalink. Made this Light and Creamy pasta for dinner tonight… so easy and yummy!! Thank you for all your great ideas… loving your blog!! Thanks for reading Cindy. There’ll be more recipes coming soon!